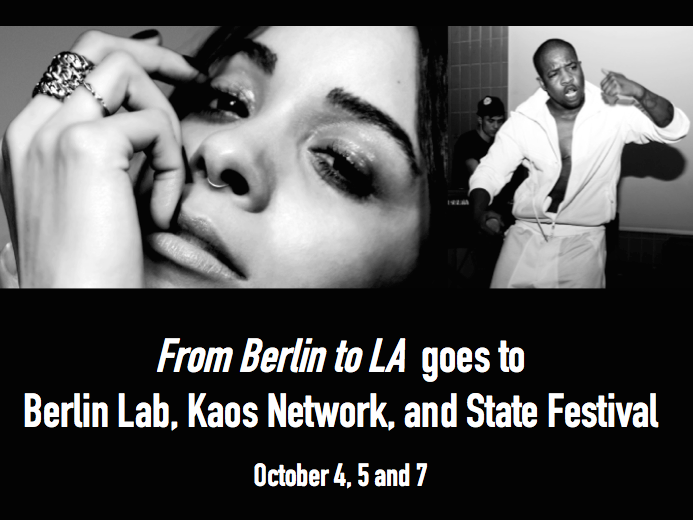 We cannot stay away from L.A. for long, and this time, after From Berlin to LA second festival in March, we are back for three events celebrating 50 years of Berlin and L.A. being sister cities, and this time around, we have brought our fav Berlin/L.A. partners from Wanted International. Lots of cultural celebrations will take place on the whole of October; YMA organise a two-day new tech and culture celebration of Berlin and L.A.’s for Berlin Partner’s Berlin Lab, followed by a day of concert and workshops with the Goethe Institut, and finally the public opening of State Festival in partnership with Cyclone. These events will feature Caroline Campbell, Heare, Rodent, Black Cracker and Simonne Jones live, Zøraya (Dublab) and Nine Inch Nilina DJ sets, 3d-mapping and VR, panels and projections by Achtung Berlin, TOA and State Festival among others, and much more. Flying Steps dance performance Black Cracker & Simonne Jones live, DJ sets by Anne Litt (KCRW), Mary Droppinz, Zøraya (Dublab) and Nine Inch Nilina, and visuals by Cloaking. Join multi-instrumentalist Simonne Jones for a first approach to song-writing, from your inspired idea, onto the piano, or a Komplete Kontrol keyboard, and onto the mic. Jones will share her technique and some tips to get you started on writing for your first songs. Black Cracker creates his tracks using elements of hip hop, pop, and future sounds. He will demonstrate how beginners can create their first beats on Maschine, and add some vocals to take these beats from the studio and to the stage as a finished simple track. DJ sets by Niko & Verdult (Cyclone), modular and harp live improv by Rodent, Heare and Caroline Campbell. Read Simonne Jones’ interview about Berlin and LA HERE, and YMA’s Nadia Says interview and listen to her Berlin/L.A. tracklist HERE. As preview, a new radio show by VC Kristi featuring Sunday, and tracks from Berlin/L.A. fav artists including Rainbow Arabia, Bana Haffar, Actually Huizenga, Perera Elsewhere, Simonne Jones, Autist, and Black Cracker. Watch a one-minute video of how we built the festival set HERE, and watch a recap of the 2-day event at Lot 613 below. Book YMA’s artists HERE, inquire about event organisation HERE.